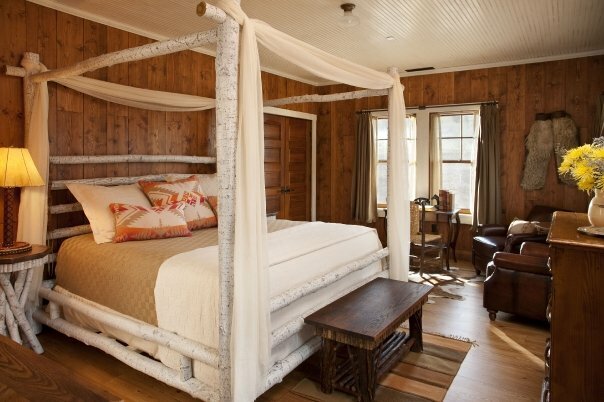 Posted September 18, 2013 by La Lune Collection & filed under Interior Design, Rustic Beds, Rustic Bunk Beds, Rustic Furniture. 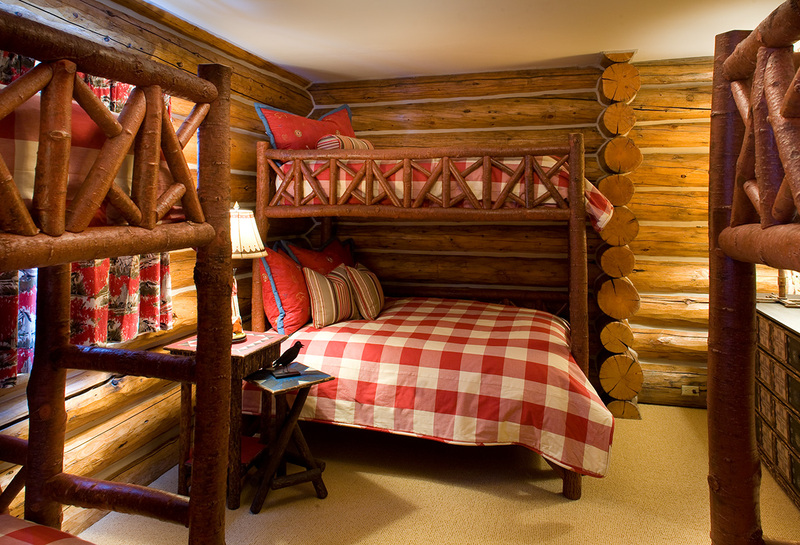 If someone mentions “rustic log bed” to you, and visions of stark hunting cabins come to mind, you may want to think again. Scores of interior designers have used La Lune Collection log beds as the centerpiece of their bedroom designs with dramatic results. One La Lune favorite is this vacation home bedroom by Laurie Waterhouse Interiors, Jackson, WY – note how Laurie has placed three La Lune Bunk Beds #4254 in a welcoming, charming guest room, cleverly choosing bunks with a twin bed on top and a full bed on the bottom, and thus creating sleeping accommodations for nine lucky guests! More dramatic rooms featuring La Lune Collection log beds are found at the luxury guest ranch, Ranch at Rock Creek in Philipsburg, MT. This “rustic log bed”, the stunning Canopy Bed #4090 in Antique White finish, invites weary “glampers” to a sweet sleep at the end of their exhilarating day of outdoor recreation. La Lune Collection features these beautiful “rustic log beds” – and more – all designed by Mario Costantini, whose years as an interior designer have imparted the collection with a unique artistic elegance. Each piece of La Lune Collection furniture is carefully crafted by hand in our small, pristine Wisconsin workshop by some of the most skilled furniture artisans in the country. Browse the collection and see for yourself!